Join Sophie for an energising and enjoyable time on the mat! The new “Baby and Me” (BaM) course will start in September. It is tailored to meet parents’ and babies’ needs. 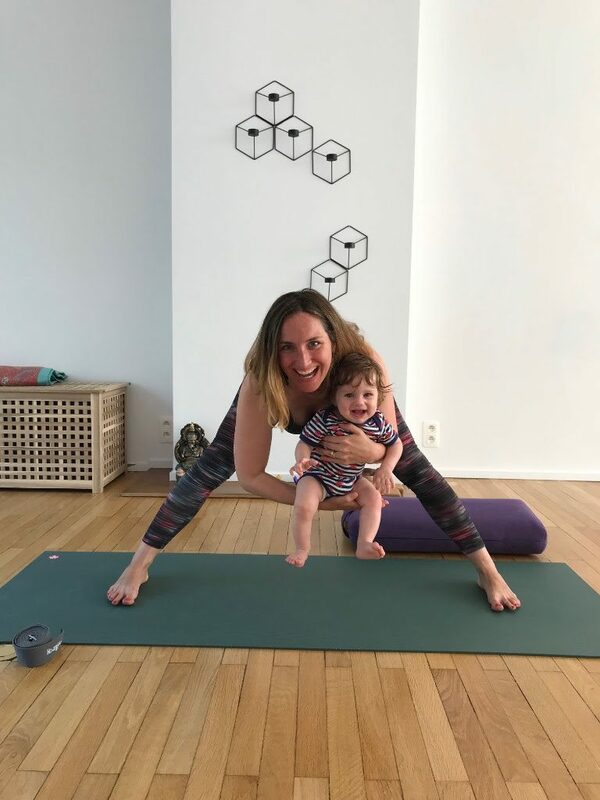 The class involves strengthening, stretching and toning exercises, provides space for mothers and fathers to relax and supports babies’ motoric development. The course is designed as to ensure quality time for parents and babies together. All babies from six weeks (8 weeks following a caesaren section) until they start crawling are welcome to join. There will be space and time for feeding and playing, so that parents can better follow the rhythm of baby. Of course, before and after the class there is room to chat with other mothers and fathers over some tea.The course runs for 14 weeks from September to December 2018 and entails 14 group classes of 90 minutes with maximum 5 participants accompanied by their babies. It includes also one individual session to address specific needs and to design an individualised home practice. The group class will be offered tuesdays from 10.30-12.00 from September to December and the package will also include one private class (date to be agreed on bilaterally). The price of this package entailing 15 sessions, that is 14 group classes of 90 minutes and one private class, is 250 Euros. If you join the course at a later stage, the price will adapt accordingly. Depending on the number of people interested and personal needs and requests, we will organise more courses at different days and times. We can also schedule a class in the (early) evening, if this is of interest to those unable to join on a weekday during daytime.